· More than 40 million students carry school backpacks (Teaching Elementary Physical Health, March 1999). · Recent research study published in the "Archives of Disease and Childhood" 2003 reports. Every year more than 13,000 backpack related office or emergency room visits in the United States occur with school age children. In the past four years there have been more than twenty documented studies showing that improperly worn backpacks may cause long term damage to a growing spine. · A 1999 study by Simmons College (Boston) professor Dr. Shelly Goodgold, Sc.D found that more than half of children in a study regularly carried more than the recommended 15% of their body weight in their school backpacks. · The U.S. Consumer Product Safety Commission estimated that more than 3,300 children, aged 5-14 years, were treated in emergency rooms for injuries related to backpacks in 1998; these numbers do not include students who went to family physicians or orthopedists. · A study by Auburn University researchers (Anniston, Alabama, Pascoe, et al) stated the most common symptom reported from back-pack use is “rucksack palsy.” This condition results when pressure put on the nerve in the shoulder causes numbness in the hands, muscle wasting, and in extreme cases, nerve damage (Journal Ergonomics, vol. 40, #6, 1997). · 58% of orthopedists polled in 1999 in Chicago and Wilmington, Delaware, reported treating children with back or shoulder pain attributable to carrying backpacks. Parents, teachers, and school officials urged to work as a team to “lighten the load”. The Puget Sound and the surrounding areas are just a part of the more than 40 million students that carry back-packs. About 20 million carry in those packs more than the recommended weight. This backpack “overload” sent over 3,000 children, ages 5-14, to hospital emergency rooms in 1999 for injuries related to backpacks. The latest studies show that up to 13,000 school age related children per year have backpack related injuries. These numbers are expected to rise (and they have) as schools around the country, for security reasons, remove or restrict access to lockers, forcing students to rely more heavily on backpacks to carry books and personal belongings. Each year, parents and teachers grow more concerned as they see children with problems associated with backpacks. Complaints include headaches, neck and shoulder pain, and numbness into the arms and hands. Studies show a direct connection to these problems being associated to an overloaded and ill-fitted backpacks. The body is trying to compensate for the change caused by the backpack’s added weight. The spine in particular, can be affected as it bends and twists to reposition this added backpack weight. When this happens pain usually results. Other problems associated with backpack overload is conditions called “Cervicobrachial syndrome and or Thoracic Outlet Syndrome”. A heavily loaded backpack causes the shoulder straps to compress delicate nerves, arteries and veins passing underneath. This can lead to numbness and tingling in the arms. 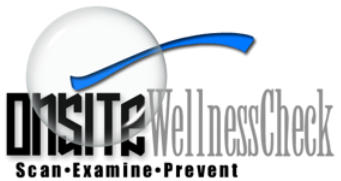 Using a digital camera, and a new advanced software program, The Onsite Wellness doctor can identify backpack safety warnings before they become serious problems. 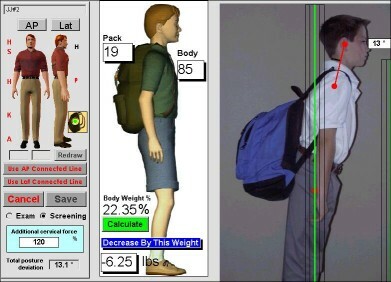 The software can calculate how much weight can safely be placed in the backpack, and show how the child's posture may be affected by an overloaded or illfitted backback. 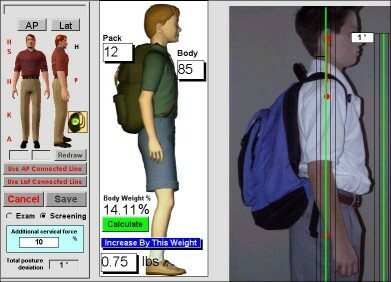 The analysis only takes about 5 minutes and can help prevent back and neck pain associated with overloaded back packs.